Like a thief in the night, this day comes unexpectedly every year, arriving whether or not I am prepared, indifferent to how it always startles me. Long after the hosannas have ended, before they begin again, the burnt echoes of songs of praise mark my forehead, the stigmata of both my mortality and my sin. Marked by a hand not my own and reminded by a voice that arrives before I can bear it: Remember that you are not your own. Remember your finitude, your death. Remember all the ways you choose to forget. And (with tender mockery) remember that there’s nothing you can do to this mark to wash it away. I remember, too, a theology class some twelve years ago when Professor Theresa Sanders asked us, “How do we know that an edge is an edge?” I have not forgotten her response: “By desperately not wanting it to be one.” I am reminded of her words every time I find that my desire for more is shocked by the unexpected edge before me. More understanding. More control. More time. Even just a moment more. But like a thief in the night, the edge arrives. Finitude haunts. It haunts like a ghost, moving from tree to tree in the back of my mind, a presence marked only by absence, by the limits of what I can know and understand. It haunts in my flesh. I have already—at thirty-two—begun to feel the wear of time. I tire more quickly than I remember. My hair is much thinner than it was when I sat in class with Prof. Sanders. Healing takes longer and my form has begun to reflect the contents of one too many delicious meals. Time devours my hopes, too. I have slackened my grip on many of the great things I once dreamt of accomplishing—the stories I would write and the widespread effect my words would have. I have less time to do these, yes. But also I better understand the momentum needed, on my part and of the world, to move these mountains of notoriety and influence. I no longer strive to strive towards such things. And I look at myself in the mirror, each day facing a growing realization of my limits—and of the ultimate limit that I will mark with my last breath. Suffer me not to be separated from myself, I pray, never, however, quite sure of myself. Never sure of myself because these very limits carve the contours of my body, my memory, my understanding, and my love. They mark my experiences of exaltation, rendering them brief—but also as distinct cherishable moments. They mark my body, limiting its reach—but also allowing my flesh to experience the touch of another. They mark my knowledge, limiting its scope—but also invigorating me to learn something new. Whatever firm ground and reassuring self-presence I might pretend to, I cannot fully forget that I am only as I am shaped by my edges. 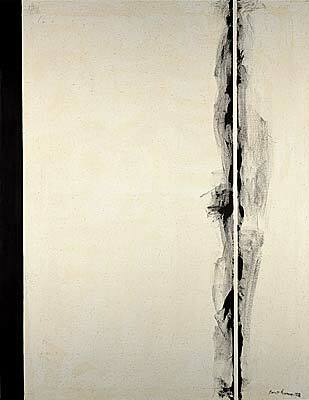 Barnett Newman, “The First Station,” from The Stations of the Cross: Lema Sabachthani (1958-66) The National Gallery of Art, Washington, D.C.
On this day, it is not the firm ground but the edge that concerns me—and more precisely the call to step off the ground into the water, where I relinquish even the posture of control, and where, let’s not forget, I may drown. Someday, I say to myself, I will face the edge. Someday, I will walk on that water. But far too often I find that I do not hope to so turn. So much of me cries out in a deep black wordless conviction against joining Christ on that water. If I ignore the edge, I whisper to myself, so quietly that I hardly know I’m doing it, if I refuse to look at that edge… then I won’t hear the call to step off. And If I don’t hear the call, I can’t be expected to follow it. So I ignore the edge and the abandonment of control, predictability, and comfort it requires. I ignore the edge—this very border that defines me (much more than any self-definition I so self-assuredly cling to). I look down at the land beneath my feet. I run my hands through the dirt and praise God for the gift. I plant seeds, tend them, and praise God for the sunlight. I focus on those small things that I tell myself are still within my control. I till the soil and reap the harvest and all the while, God knows, I ignore that edge. I put it out of my mind, hide it behind the hedge I’ve planted, a hedge of both insubstantial distractions and deep cares. And because I do not hope to turn back to that edge, I choose to rejoice here where I am comfortable, here where I’ve to constructed something upon which to rejoice. It’s safer. It requires so much less. But in refusing to come to joyous acceptance of my edge and all it demands of me, I deform the gift of finite life and crusade against it. Thus—and here’s where it gets really twisted—I don’t want anyone else to point out that which I try so hard to forget. When looking at the face of another, I don’t want to see, to really see, their edges either. Their natural limits of time, space, ability, and circumstance begin to remind me of my own. So I ignore them—I reject them. “Them” meaning their edges, certainly. But also anything authentic about the lives of others that might force me to be honest about my insubstantial control of my own life. Because—here’s the thing—I know that I ought to be standing beside them as they face their own edges. I know I have been called to their edges as much as to my own, to feeding them when they are hungry, giving drink when they are thirsty, welcoming them when they are strangers, clothing them when they are naked, and visiting them in prison (be it federal, state, or the one in their own minds). But no, I don’t want to see their edges. Entering into their collapse, I fear that their drowning will inevitably remind me of all those edges I have been so focused on forgetting. Except on this day. Today I cannot shake this Jesus who moves from tree to tree in the back of my mind, a wild ragged figure motioning me to turn around and come off into the dark where I might be walking on the water and not know it and then suddenly know it and drown. Either way, this particular edge is well out of my control. Someone else’s hand will mark me. Someone else’s voice will call to me. Ash Wednesday stands against the falsehood that I cling to, the lie that I can retain control and avoid the edge that always arrives. Lent can seem to be a season of self-control. I can focus on those things I give up, the fasting, prayer, and almsgiving that I do. I can focus on the journey of purification, such that it is. I can discipline my desire and my selfishness. I can make my heart pure. But more properly, Lent calls us to abandon that very deception that I can make enough of myself. That I can be good enough. Faithful enough. Hopeful enough. Loving enough. That I can, though my effort, transgress my finitude, and achieve spiritual success. That by clinging to those things I already know and those circumstances I can control I can finally “be enough” to avoid my edge. But Lent calls us to renounce the lie that I can bring myself this point of enough where I no longer have to face my edge. O Lord, I almost cannot pray my request, Suffer me not to mock myself with this falsehood. It is a prayer terrifying to behold, a request that I almost hope God does not hear. And as soon as I say it, I want to take it back. Let me remain as I am, I correct myself, with my two eyes open to what I want to see, my hands always handling the familiar thing, my feet on the known track, and my tongue not too loose. Let me stay as I am, O Lord, for if I am to be honest with you, I’m not sure that I hope to turn again. But it’s too late. I already have my response, given before I began my first prayer, and well before its faint-hearted amendment. It comes like a thief in the night: unexpected, uncontrolled, and gratuitous. I know what it is, what it always has been: the stigmata of ashes. My coming to grips—or at the very least beginning to—with my limits is not a matter of resignation but of turning. Turning to receive to what has already been offered. Turning to respond to what has already been said. With the ashes, we find that our penance has already begun. This penance—stigmatized first in the ashes, but intentionally marked in various other ways during Lent—is not our required part to acquire forgiveness. Let me say it again: penance is not the “I’m Sorry” we say to God to elicit the divine, “I forgive you.” For God’s forgiveness—God’s offer of grace—is the thing I cannot control par excellence; it is the very definition of a gratuitous gift: unearned, unexpected, and uncontrolled. The grace arrives like the Risen Christ: despite the locked doors of our hearts. And like the nail marks on his hands, our own stigmata do not fade away. All the scars that we are hesitant to accept, scars of failure and of sin, scars of death and of ending, the stigmata of our own finitude—both that inevitable death which is given to us in birth and the empty forgetting by which we try to disregard that gift—last well after we wash away the ashes. But like the crossed scars of Christ, ours need not haunt us. Because they already begin to mark the salvation of our God. On this day, people find their way to the Church, whether they feel completely at home there or not. The cynics can sing, in chorus, that people want the “thing.” They want the take away, the external symbol—the ashes. They want to do something to appease the angry deity, to merit blessing. But we who are marked with ashes hope for better. Yes, we know how desperately we don’t want our edges to be edges; but even more, we know how we hope in the promise that these edges marking our limits also mark the opening for love. We hope that our limitations do not, ultimately, weigh us down into ourselves, but allow our love to move us toward the brokenness in others. Towards the brokenness of the cross. There we find that drowning or not drowning has never really been the issue that our compulsion for control has convinced us it was. We find that these edges, given to us, also give us a place to pause and hear the prayer sent from far deeper than our self-deception: Lord, suffer us not to mock ourselves with falsehood. It is at the edge that we can hear the call that has always been there, the call that invites us to take that step out of our boat and not hide behind stories that comfort but cannot save. The call whose cry shatters our deafness, whose radiance puts flight to our blindness, whose touch moves us to burn for peace. We hear the invitation from that itinerant rabbi from Nazareth calling to us from the far too often hidden recesses of our heart—no matter how many barriers we erect between ourselves and our depth. It is a call we feel when the hand of an other marks us with ashes, giving us the stigmata that do not permit us to mock ourselves with falsehood but turn us again and open us to the edge. * I don’t presume to have the right words and hence borrow without shame from my betters. After all, as it is their faith that I have inherited, and if they have been so generous with that which is more intimate to them than they are to themselves, I hope they will forgive my receiving their words as gifts as well, bequeathed without condition or stipulation. Unconditioned this gift might be, still I tip my hat and heart to T.S. Eliot, Theresa Sanders, Flannery O’Connor, Jean-Luc Marion, and Augustine, the once bishop of Hippo. I really like the connection you make here between lent and control. So many things that people “give up” seem to be more for themselves (without God) rather than for God (with themselves). Our reality as dependent, social animals should come alive in this season where we give ourselves up to God. Thanks, Kevin. I am reminded of a story a buddy of mine tells about an Ash Wednesday Mass he attended as an undergrad as a Catholic university. As the priest began his homily, he paused, pushed his notes aside, and (pounding his fist on the ambo) proclaimed, “You can’t give up a sin for Lent. You shouldn’t be doing it anyway!” He went on to say that Lent isn’t properly a time to give up snacks so you can loose weight, but to turn back to God. It’s a strange thing to give up something good (something that very well can often remind us of God) so we might turn again, and it certainly runs counter to a mentality that seeks to acquire and hold tightly to all good things. But giving up the good–because good–can serve to remind us that each good is created, ultimately, by means of the created gifts given to us by God. Thanks for sharing this on Facebook. I can’t relate to all of it but can relate to your points regarding limits and enoughness and how, maybe because we are always aware of the edge to some degree, we work so hard to be enough; do enough; etc. An awareness of our mortality and limits at self-fulfillment should never, in my opinion, negate living. If handled properly the awareness can in fact allow us to live authentically; with full knowledge and acceptance of who we are where we’re headed, regardless of whatever we do or “become” in this life, and yet still accepting, really accepting, the gift of live as given. Again as given: i.e. it’s limited. We have the power and the glory to do all that our civilization has done and continues to do and yet, because of the structure of reality imposed on us, it can indeed all be taken away in a flash. But if we want to honor the Maker we need, in my opinion, to accept and use the gift of life as given to us. Thanks for your reflection. What makes it all the more difficult, is the fact that, in a way, we ought to strive against our perceived limitations. This is how we continue to grow. The challenge is that–beyond some obvious big ones (aging, death, taxes), there is little we know–for sure–to be a limitation. Even things that we know to be ultimately limited (seeing the face of God directly) do not require us to give up our restless movement further toward our edge. So the key, as you put it, is “really accepting”–of always moving towards our proper end, but recognizing all the while the various an sundry limitations that will stand in our way.